@DrumheadDave follows the Pass It On account on Twitter. After nominating ‘Theatre on the Fly’ for CFT’s 100 Greatest, we asked him to share more of his memories about this unique temporary structure. 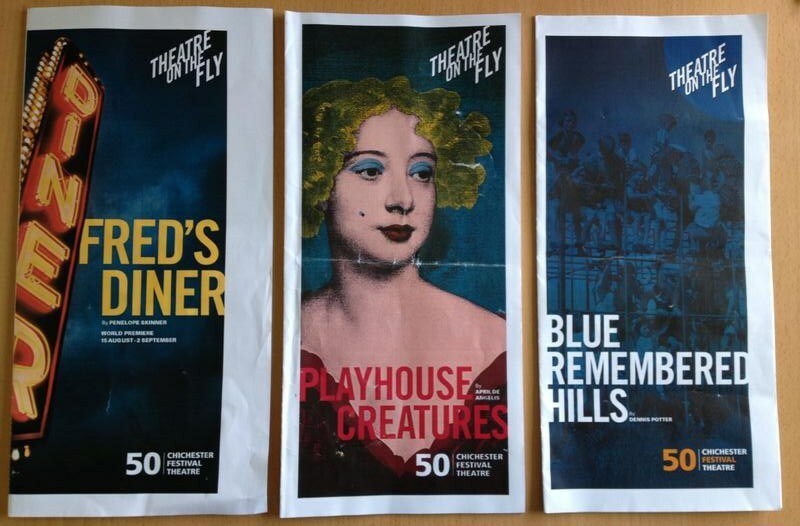 Of all the celebrations that took place for Chichester Festival Theatre’s 50th anniversary in 2012, ‘Theatre on the Fly’ was the one thing that really captured my imagination and compelled me to get involved. Theatre on the Fly seemed like a blank sheet of paper. It was temporary, it was on the fly, it was an opportunity do and try so many things that the conventions of the main house precluded. First and foremost, it was a community construction project. I’m a 40-year-old man and I still love Lego. IKEA flat packs seem like a challenge, but rarely satisfies. I will dabble with small DIY tasks, but I know my limits, and a building (that could be fit for human habitation) is way beyond. So the opportunity to enthusiastically wield a hammer in a controlled and supervised setting was an obvious draw. Collaborating in the creation of something of cultural value and claiming back some community ownership of Chichester Festival Theatre were obvious benefits (if called upon to make considered and insightful comment) but mainly it was about the hammering. Sorry. Unfortunately, I didn’t get to wield a hammer. I had a day job, we had a baby and the timings didn’t work out. Disappointing, but there we go. A very polite exchange of emails encouraged me to consider volunteering as an usher as a way of staying involved with the project. I’ll be honest, I wasn’t grabbed. But this was on the fly, it couldn’t happen with the same resources of the main house, it had to happen in a very different way. Having local volunteers there every night seemed to personify that, so I agreed. Theatre on the Fly was a thing of beauty; its simple scaffold and timber structure created an impromptu performance space that felt very special. It wasn’t fragile, but it felt temporary – and the magic of some of the performances were born from the knowledge that this wouldn’t last. 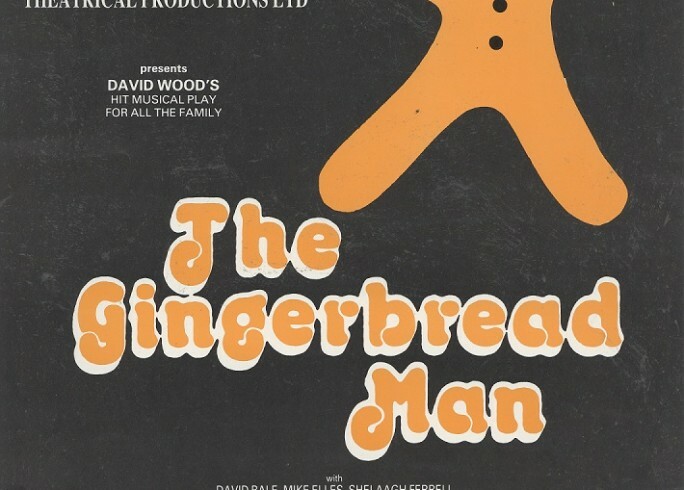 Some audience members had higher expectations: unallocated seats, sharing benches with the great unwashed, walls you could see through, programmes that had been photocopied, distractions from Oaklands Park in the background – there was much to explain, and defend. But the space won them over; performances were rawer, more intense, more urgent in reaction to the constraints and opportunities presented by such a performance space. 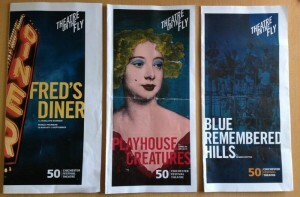 I was lucky to see performances of three productions: Blue Remembered Hills, Playhouse Creatures and Fred’s Diner. Ushering and some very light duties during the performances (mainly standing out of the way, but occasionally lifting a curtain) seemed a very small price to pay for seeing such immaculate, intense performances for free. I particularly enjoyed Playhouse Creatures: there seemed something incredibly apt about a play about playhouses in a playhouse that wasn’t the playhouse. People loved Theatre on the Fly. It made them love theatre, rediscover a joy for live performance, crave that greater suspension of disbelief. Like the very best of things, people wanted Theatre on the Fly to stay. But like the very best of things, its magic was of its time. The short season finished and the raw materials were disassembled, repurposed and re-used back in the community it was born from. Theatre on the Fly was an inspiration to all and has a legacy in the directors it encouraged, and instilled the confidence that a temporary space could work at Chichester. Read an article about Theatre on the Fly by architecture and design magazine, Dezeen.